This past Saturday, at the Collingswood Farmers’ Market in South Jersey, I purchased three mutant sized portabella mushroom caps. I was amazed at the weight of the bag. Even though we live 60 miles from the coast of New Jersey, I don’t always use fresh crab. 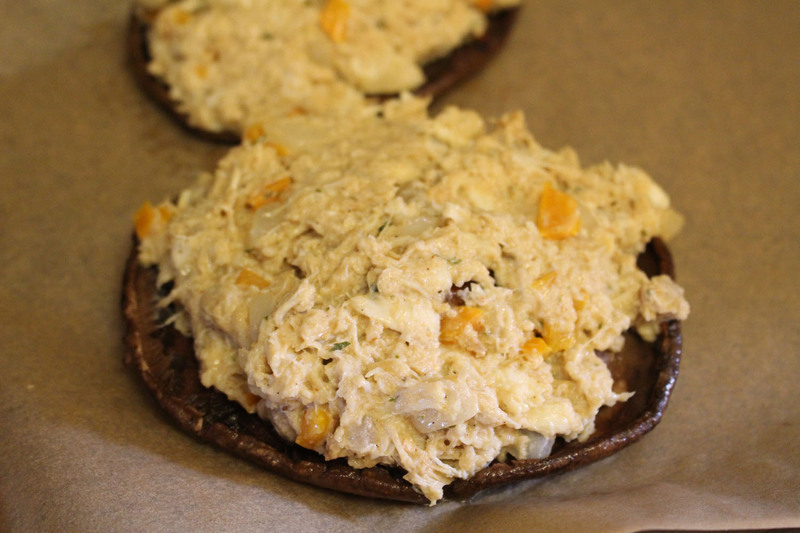 I developed this recipe with ingredients I had on hand, which included a container of crab that I had previously purchased at our local market’s seafood section. After putting the recipe totally together, stuffing the caps, baking them, plating, and photographing them, I said to DH, “You might want to only eat half as they are enormous!” We both took one whole one and I initially cut mine in half, however it was so tasty, I ate the second half too, and DH and MIL ate their entire ones too. 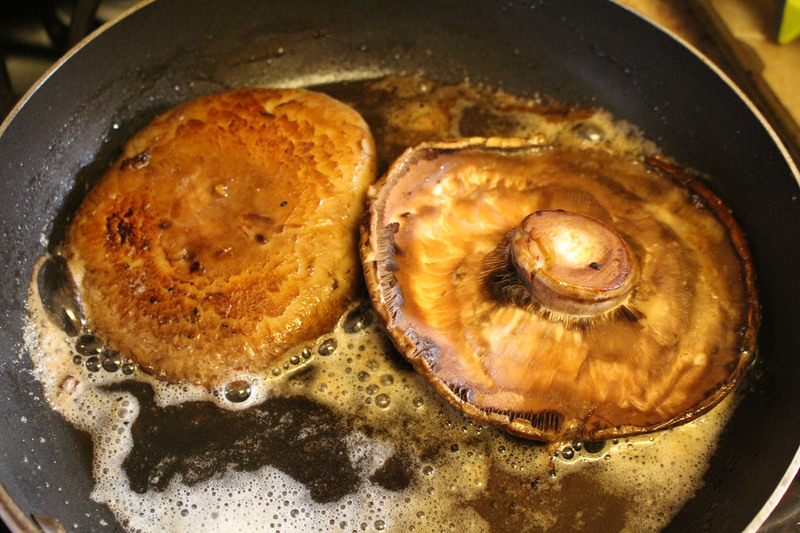 Use a damp cloth to remove any loose dirt from the mushrooms. Take a teaspoon and gently use the edge and scrape out the gills. 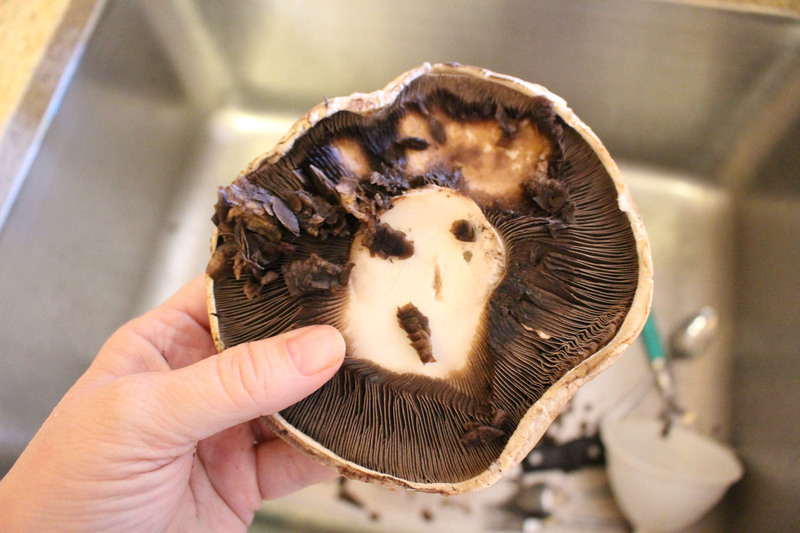 If your mushrooms have hard woody stems, cut them out and discard. Clean, remove seeds and dice flesh of 1/2 bell pepper. Place onions and peppers in a microwave and cook them for 2 minutes. Add olive oil to a skillet and saute onions and peppers for 5 minutes on medium low heat. Add garlic and saute for an additional minute, then remove from heat and set aside in a large bowl. Remove from heat and place caps on parchment paper lining a jelly roll pan (cookie sheet with sides) or large baking dish with stem sides up. In the bowl with onion, bell pepper and garlic, add Worcestershire sauce, crab Caesar dressing, breadcrumbs, nutmeg and optional Old Bay Seasoning and mix all together. (At this point you can taste it to see if you want to add more Old Bay or not). Lightly whisk the egg and mix it with the crab thoroughly. Stuff crab mixture into the mushrooms.